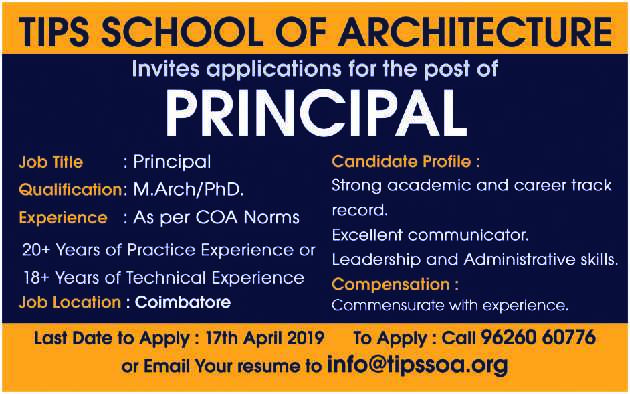 TIPS School of Architecture, Coimbatore has advertised in THE HINDU newspaper for recruitment of Principal job vacancy. Interested and eligible job aspirants are requested to apply on or before 17th April 2019. Check out further more details below. About College: At TIPS we embrace a child-centered philosophy that promotes creative thinking and lifelong learning. Our educators are dedicated to inspiring children to achieve the very highest standards in all their endeavors as they progress their educational journey with us. Through partnerships with parents, we strive to make every academic dream a reality.